[Episcopal News Service] Episcopalians, congregations and dioceses across the Southeast again are assessing the damage and praying for the best after another powerful hurricane wreaked havoc on the communities in its path. Last month it was Hurricane Florence, which hit coastal North Carolina hard and also brought wind, rain and flooding to parts of South Carolina and Virginia and cities farther inland. 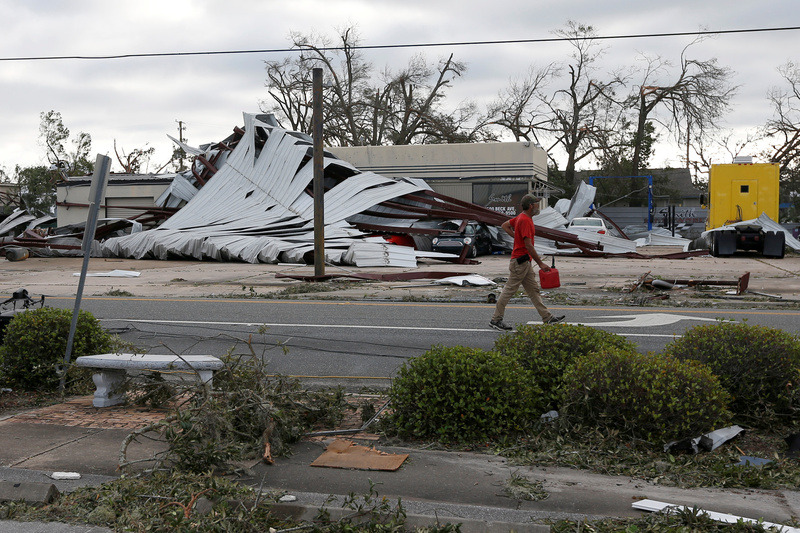 On Oct. 10, Hurricane Michael made landfall near Panama City, Florida, as one of the strongest hurricanes ever to hit the mainland United States. At least two people are dead as Michael left buildings in ruin, blocked roads and power outages affecting hundreds of thousands. Michael weakened Oct. 11 to a tropical storm as it made its way across the Carolinas, dropping more rain on regions already struggling to bounce back from Florence. The latest storm is moving rapidly northeast and is expected to head out to sea by early Oct. 12. Episcopal Relief & Development, the agency that works at the churchwide level to help coordinate disaster response, began holding conference calls with dioceses before the storm hit, and that outreach continues as local leaders assess the needs of their communities. Michael intensified surprisingly fast into a Category 4 hurricane before hitting land, forcing residents and church leaders to expedite their preparations and evacuations. In the Diocese of Florida, Christ Church in Monticello shared photos on its Facebook page of volunteers boarding up the church’s windows on Oct. 9. “Hope everyone remains safe as Michael approaches,” the post said. Farther west along the Florida Panhandle, in the Diocese of the Central Gulf Coast, the Rev. Thomas Dwyer was bracing for the worst. Dwyer told Episcopal News Service by email on Oct. 11 that he fled the city before the hurricane. He heard from someone who made it to the church afterward that the building was damaged but survived the hurricane. The Diocese of the Central Gulf Coast posted hurricane preparation info prominently on its website well before Hurricane Michael arrived, and Bishop Russell Kendrick issued a statement Oct. 9 offering prayers and support to the members of his diocese, which includes the western Panhandle of Florida and southern Alabama. He followed up Oct. 11 with a video message. Kendrick and other diocesan leaders gathered for a morning staff meeting Oct. 11 to share updates on the storm’s aftermath and plan their next steps. Communication has been difficult in some areas, so information was still flowing in from various congregations. “We do know that there has been damage to several of our church buildings,” Kendrick said. He didn’t have details but identified the churches with confirmed damage as Holy Nativity Episcopal Church and St. Andrew’s Episcopal Church in Panama City, Grace Episcopal Church in Panama City Beach and St. James’ in Port St. Joe. A similar assessment was underway in the Diocese of Georgia, which encompasses the southern half of the state. The diocese had been tracking congregations through an alert system, and by Oct. 11 more than 100 messages had come in, according to Katie Willoughby, the diocese’s canon for administration. Bainbridge, Georgia, was one of the communities in the diocese reporting the most damage, Willoughby told ENS by phone. Thomasville, Albany and Americus also were hit hard, but most of the damage reported so far was downed trees. Church buildings seemed intact. “Generally, we came through well; however, we have some significant tree damage,” she said. Several parishioners also reported trees falling onto their homes. Information is only trickling in about the congregations in Panama City, the small Gulf Coast city that was in the direct line of the storm. News reports from that region paint an alarming picture. A 300-bed hospital in Panama City was forced to evacuate Oct. 11 after the hurricane turned parts of the complex into tatters. The storm wiped out the roofs of high-rise condos, knocked down trees, tossed boats around like toys, and left the city looking like a “complete war zone,” according to one Facebook user who posted video of the destruction. The Rev. Steve Bates, who fled Panama City before the storm with his wife, posted a forlorn update Oct. 11 on the Facebook page of Holy Nativity Episcopal Church, where Bates is rector.